USE Provide a fast, economical means of repairing or preventing leaks in cast iron bells, caulked or rubber ring joints. 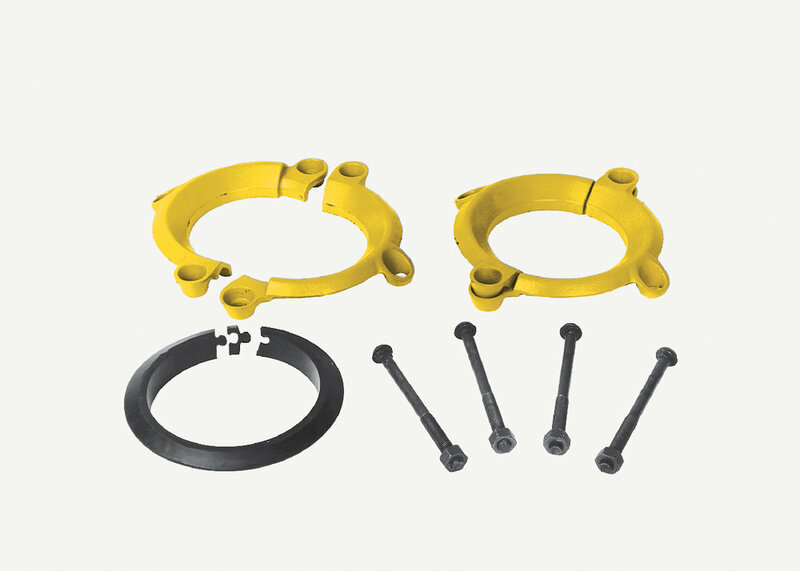 Our unique gasket and ring design enables a single clamp to fit both caulked and rubber ring joints for most classes of cast iron and ductile iron pipe within a nominal size. They also can be used on AWWA C900 PVC pipe. COMPATIBILITY Cast iron, ductile iron and C900 PVC pipe. CASTINGS The rings are cast from ductile (nodular) iron, meeting or exceeding ASTM A 536, Grade 65-45-12. GASKETS Gaskets are made from virgin Styrene Butadiene Rubber (SBR) compounded for water and sewer service in accordance with ASTM D 2000 MBA 710. Other compounds available for petroleum, chemicals, or high temperature service. BOLTS AND NUTS 5/8 inch, High strength low alloy steel trackhead bolts. National coarse rolled thread and heavy hex nuts. Steel meets AWWA C111 composition specifications. Stainless steel bolts and nuts available. ARMORS (10" &12") Stainless steel, to bridge gap between castings.